Last night my husband returned from the fish market with two large salmon steaks. While we typically enjoy salmon fillets, the steaks were a tasty alternative. 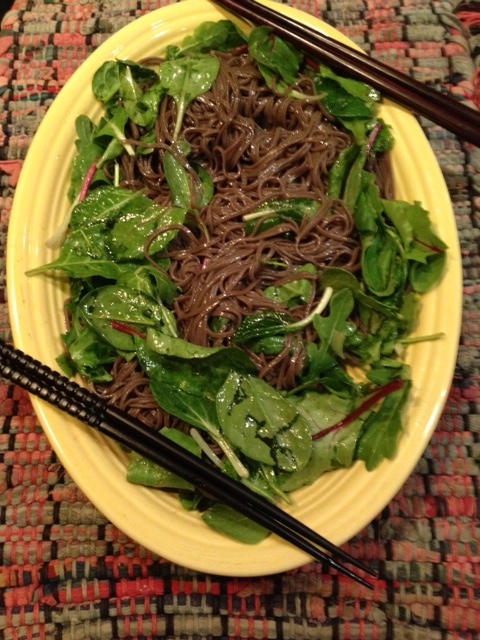 I decided on an Asian theme as I remembered some soba – Japanese buckwheat – noodles among our pastas. I sautéed the salmon steaks in a nonstick pan with a few tablespoons of salted Irish butter. The total cook time was about 11 minutes as the steaks were so substantial – we shared one and saved the rest for today’s lunch. I flipped the steaks back and forth several times with large wooden spatulas so that each side became a golden brown. After removing them from the pan, I sliced each steak into two along the center bone and topped with chopped chives, French finishing salt and a squeeze of lemon. For the side, I prepared the soba noodles according to the package instructions, boiling them for 5 minutes and then running cold water into the pot to prevent them from sticking together. Using a wire ladle, I scooped the noodles into a serving dish and mixed in fresh greens, including baby bok choy and red chard. A generous drizzle of sesame oil and soy sauce as well as some fresh ground pepper served as the seasoning for the side. 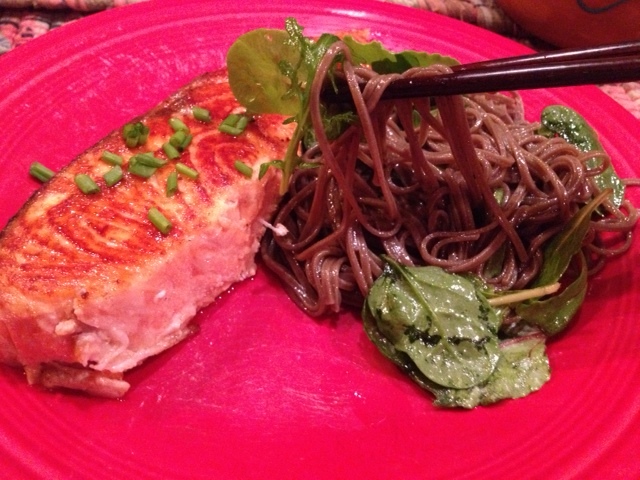 This entry was posted in Uncategorized and tagged Bok choy, Buckwheat, Chard, Food, Noodles, Recipe, Salmon, Soba. Bookmark the permalink. my favorite ! I have lunch envy now!